We are proud to offer laser therapy using the Theralase laser. The Theralase laser is unmatched in the industry. We penetrate further, heal faster, and relieve your suffering; sometimes after only minutes of treatment. joint mobility, increase tissue integrity and promote cell regeneration. Theralase lasers work by supplying energy to the body in the form of billions of photons of light. The body absorbs this laser light on a cellular level and transforms it into chemical energy, which the body then uses to commence its own tissue repairs. The biostimulating effect of laser therapy causes a decrease in inflammation and pain and an increase in tissue regeneration and healing. Neuromuscular Skeletal conditions are common in all of us. We can all experience sprains, strains and pain that just won't go away resulting from repetitive strains in our work place or from trauma in our everyday lives. Pain and inflammation are things we've grown to accept as something we probably will just have to live with. Medical practitioners across North America have discovered a modern medical technology that heals injuries safely and effectively on a cellular level. 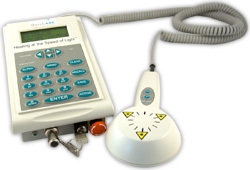 This medical technology is the Theralase line of therapeutic medical laser systems. The Theralase superpulsed laser system can penetrate up to 4 inches into tissue, to promote cellular regeneration at the source of injury. Laser energy helps to repair damaged cells by accelerating the body's natural healing mechanisms. Depending on the severity of the injury, you can return to an active lifestyle pain-free within a few weeks versus months or years of life altering pain. A proven medical device that safely and effectively stimulates deep tissue regeneration and relieves pain and inflammation. Laser light stimulates fibroblast development and accelerates collagen synthesis in damaged tissue. Laser light reduces swelling caused by bruising or inflammation of joints to provide enhanced joint mobility. Laser light reduces the formation of scar tissue following tissue damage from: cuts, scratches, burns, or post surgery. Higher outputs of specific enzymes, greater oxygen and food particle loads for blood cells and thus greater production of the basic food source for cells, Adenosine triphosphate (ATP). Laser light induces temporary vasodilation increasing blood flow to damaged areas. 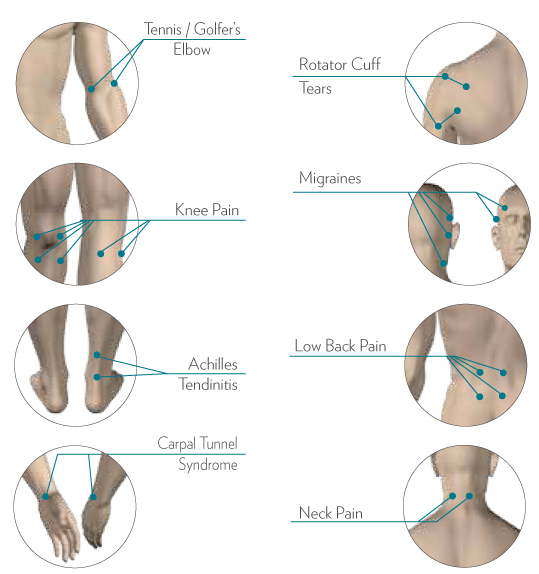 Slow recovery of nerve function in damaged tissue can result in "dead" limbs or numb areas. Laser light speeds up the process of nerve cell reconnection to bring the numb areas back to life. No. There are two general types of medical lasers: heat generating lasers which cut through tissue and cold lasers, such as the Theralase, which stimulate tissue repair and reduce inflammation. No. Theralase lasers used for tissue stimulation are not strong enough to damage cells; so even if they were used 24 hours a day, they would not be able to harm you. Yes. Theralase laser therapy is safe, effective and painless, with results which are often immediate with no side effects. Efficacy rates in excess of 90% are routinely achieved. How do Theralase lasers work? Treatment time will vary from as little as 2 minutes to as long as 20 minutes. The total number of treatments required varies between 5 to 25 depending on the body's natural healing rate and the severity of the condition. I use the Theralase laser to keep my throwing arm healthy. It reduces fatigue and allows me to play at my peak game after game after game. I feel compelled to let it be known how successful Laser Therapy has been in reducing swelling and pain of Osteo-Arthritis in my right hand and fingers. During the past years, I have been prescribed many medications, none of which reduced the swelling and pain satisfactorily. After four to five sessions of Laser Therapy, there was an extremely noticeable reduction in swelling. It was now almost pain free and because of the increased flexibility of my fingers, I was able to resume activities which for a long time had not been possible. The Laser Therapy sessions are quick and completely painless and do not have the dangerous side effects I had previously experienced with medications. physiotherapy and even acupuncture, but the shoulder continued to be achy. I found it difficult to rest my weight on my arm when I sat at my desk. I constantly felt like I carried a 100 lb. weight on my shoulder. I endured the pain and discomfort for 12 years, until recently. A few months ago, a friend suggested I should try Theralase low level laser therapy. After a consultation with their Chiropractor and Physiotherapist, I received 6 treatments with 905 nm, 100 mW near infrared laser at the Theralase Pain and Arthritis Centre. By the 6th treatment, my shoulder felt normal. There was absolutely no heat sensation or discomfort during the treatments and the treatments were only a few minutes long.